Microsoft Singapore have recently released their web-based Messenger. This new version is built on top of the Messenger Library. You don't need to install anything. You just need a web-browser and a Windows Live account to chat with your contacs. This version is not the one included in Hotmail, so it's totally independent of the Microsoft's mail service. 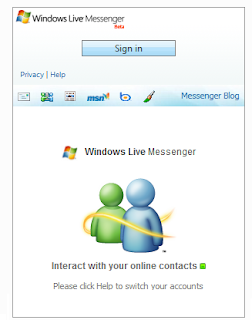 The new Windows Live Messenger works from any country but has only been released for Singapore users. This can be some marketing campaign targeted exclusively to that territory, or Microsoft is gradually introducing this new version of its web-messenger in different places.